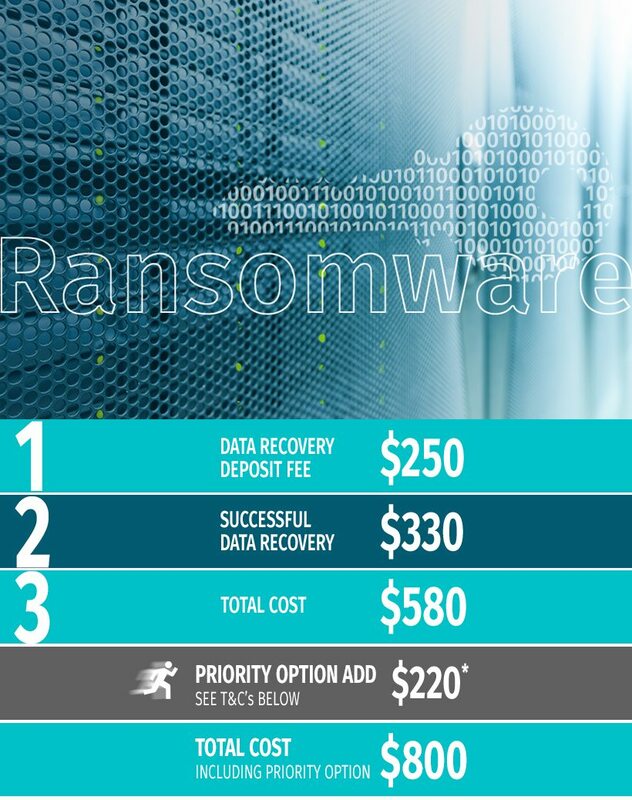 Ransomware Removal | Corporate Data Recovery | Don't Pay The Ransom! Ransomware is a type of malicious software, that stems from cryptovirology that threatens to publish the victim’s data or block access to it, unless a ransom is paid. While some simple ransomware may lock the system in a way which is not difficult for a knowledgeable person to reverse, more advanced malware uses a technique called cryptoviral extortion, in which it encrypts or archives the victim’s files, making them inaccessible, and demands a ransom payment to decrypt them. In a properly planned and implemented extortion attack, recovering the files without the decryption key is a difficult problem, but not impossible. But it is even more difficult, is to trace digital currencies used for the ransoms, making tracing and prosecuting the perpetrators. Corporate Data Recovery is here to help. *If your recovery of data requires immediate attention, then click on the Priority Button to select this service. This ensures your drive is placed at the top of the recovery service schedule. Please note, the priority option fee is not included in the total cost above. Please note: Following the receipt of your hard drive, we will perform extensive testing to recover the data. Whilst we are confident of recovering files that have been blocked from access through a ransomware attack, there are some variations which require specific key codes. In these circumstances you will be informed of the result and options. In February 2016 the Hollywood Presbyterian Medical Center, in Los Angeles, paid a ransom of about US$17,000 to hackers who infiltrated and disabled its computer network with ransomware. Ultimately, the computer network was closed and so were the medical records of 1000’s of people. To understand the gravity of the Ransomware problem, imaging having to turn back the clocks to a time when communication was by telephone, there was no internet, and money was transferred by cheque. The medical centre in question did just that. Being forced to move back to paper and fax communication until the IT team can fix the problem and restore the network is no easy task. Ransomware is a deliberate infiltration of IT systems with the sole purpose of locking out its users by encrypting the files. Until a ransom is paid, the system is inaccessible. The Hollywood Presbyterian Medical Center decided to pay the ransom because this was in the best interest of the patients affected by the network closure. Ransomware has a number of variants and levels of lockout but its main purpose is to force the owner into paying a ransom for the ‘key’ to unlock their computer. Its rapid spread across networks can be driven by malware or a virus that quickly infiltrates computer networks or single users. via email attachments, website malware, spam, social engineering, direct hardware use (USB drives). Ransomware arrives on the users computer and then begins its process. Ransomware process searches for the user files on the computer. These may be images, music, video and documents. One scenario is the possible renaming of files, encrypting and then renaming again. The computer system displays the Ransomware demands. Why is Ransomware so damaging? Ransomware leaves the end user with only two options. Not pay and simply lose all the stored data and information. For many people the choice of not losing their data simply isn’t an option and paying a criminal for something that is already yours is of course distasteful, but the easiest path to restore a sense of normality back to their life. For some however, the thought of giving money to a criminal is nothing short of immoral. Other questions about where the proceeds go or who is behind the invasion of privacy are pure speculation but I know, I would rather lose my data than pay a criminal. Despite every effort to protect a network or single computer, if your backup of your files is not off-site or disconnected from your network, you will still be vulnerable to attack. The safest way to protect your system is to backup to an offsite service or cloud. Even with the latest anti-virus you will still have some vulnerability and ransomware variants are many and being constantly modified. One of our greatest weaknesses is constantly exploited through email. We say we are tired of Spam email, but we still allow a considerable amount of traffic through our email filters. Watch out for emails from well recognised institutions such as our banks or Australia Post. The Australian Tax Office is a favourite and even major brands. As an example, the bank may send you information to check your balance. The ATO may be informing you of a potential tax return, a well know brand could be offering you a free trial. All of these require some discretion. Think carefully about the message and ask yourself, would this organisation communicate like this. Sometimes, a dead giveaway is seeing the email address of the sender. What do I do if I do get a Ransomware message? If you have been unfortunate and you are the target of a Ransomware message, you do still have some options available. Calling Corporate Data Recovery as soon as you know your system has been infected can offer you the choice of sending in your drive and having the data recovered. We have several methods of un-encrypting ransomeware locked files, and though this is dependent on the type of encryption employed, our means of working around the locked files are many.